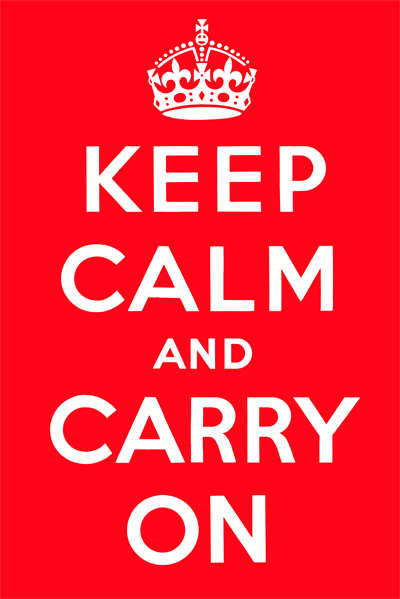 I believe we were the last people on Earth to discover the Keep Calm and Carry On poster. Gayle, my wife, was searching on-line for an out-of-print book and came across an (to us) obscure used-book shop in the far, far north of England called Barter Books. They had the book, and so much more. It turns out Barter Books is not only the largest used-book shop in England (I mean, “antiquarian and secondhand”), it also the wittiest. Along with the book they sent all kinds of funny things, a funny map to their location (Alnwick Station, Wagon Way Rd, Alnwick, NE66 2NP, United Kingdom), a funny book mark, and a funny flyer. And not only are they funniest book shop in all of merry England, they are perhaps the smartest. Like Amazon, it seems they have decided books are a loss leader and now make a great deal of their money selling non-books, the greatest example of which is a reproduction of an uncirculated World War II propaganda poster called Keep Calm and Carry On plus an assortment of Keep Calm and Carry On t-shirts, mugs, and mouse pads (or is it mice pads?). Indeed, Gayle (the wife) could hardly resist the allure of so many clever items that were not books, so that, in addition to the out-of-print volume now forgotten on some shelf, she purchased both the poster and the mouse pad. Then, well aware of the state I almost always in, she gave the poster to me. And what an effect those words had. Keep Calm and Carry On. This tells me exactly what every writer needs to do at almost every moment of his or her life. Keep Calm, but please, yes, if you can get around to it, and if the muse strikes you, and if you don’t have a million other things you’d rather be engaged in like sorting your socks or planning next year’s Christmas party, do indeed Carry On. Every writer should have these words emblazoned on his or her soul, or, as I do, tacked to my garden window, which is just at the edge of my vision so I always know it is there, a crimson icon of benevolent grace. Apparently the poster had long ago taken on all of England. You will see it at hospital nursing stations, banks, colleges, sporting facilities, and doubtless over the Queen’s bed. It has appeared, according to Wikipedia, at 10 Downing Street, Buckingham Palace, and the American Embassy. It’s become so popular in England that another company tried to hijack it and trademark the name for themselves and a great and nasty trade war has ensued (and continues to this day). What a tragedy! 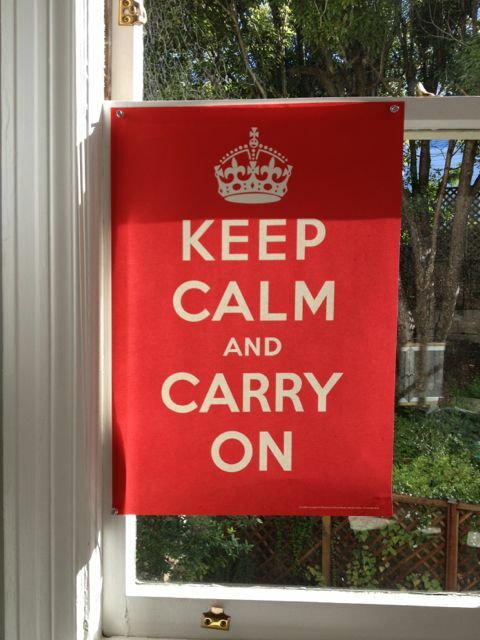 Because now nobody in England is actually keeping calm, although I understand there is still a great deal of carrying on. But all that aside, when you are a writer you are always on the verge of a nervous breakdown, aren’t you? First you have to actually think of something to write, and then you have to commit to writing it, which means all those other novels you’ve been thinking about will have to wait and what if the one you’ve chosen is the wrong one? Then you have to sit there and write it; and each day, each moment, presents a choice, a terrible choice: Does Amy say no when Chester puts his hand up her skirt? Does she say yes? Or does she realize it’s not even Chester, but Sylvia with her hand up her skirt? Each sentence, each word, carries with it the terrible burden of a road not taken, a dead end, a cliff just beyond the tree line. When this happens to me, which is about every minute or so, I turn my gaze steadily to my beautiful red poster, so stately and serene, so very, very British, and I say, Keep Calm, Michael, and Carry on. But then I remember who won that war. It wasn’t the British. It was we. Same for WWI. The War of 1812. And don’t forget the Revolution. So maybe all this keeping calm and carrying on is a little overblown. Maybe screaming and yelling and pulling out one’s hair isn’t the worst thing that could happen.